“We’re all stories, in the end.” ― Steven Moffat. Our story starts from the day we are born till we leave a legacy behind. Life is all about Magical Stories. Colgate-Palmolive (India) Limited, has launched the “Magical Space Adventure” special packs for kids to discover a whole new magical universe and create their own stories every day. The Colgate “Magical Space Adventure” has three different sets based on the ‘Magical Space’ theme to cut, play and learn – explore the mystical Alien Planet, float around the zero gravity Space Walk and experience the thrilling Space Launch. With more than 15 space characters, these packs will take kids on an adventurous journey into the magical space world. These packs are an opportunity to learn while having fun. The kids can create their own secret universe thereby expanding their creative canvas. We will send you these packs. Once you receive them, let the child cut, play and learn with you. Encourage them to think and form a story with the characters from these packs. This is a wonderful way to spend time with children while ensuring they imagine something fantastic out of these characters and weave a story. 15 best blog posts win vouchers worth Rs. 1000 each! Once you are shortlisted, you will receive the product. Encourage the child to cut out the space characters given inside each pack and create a story around these special space characters. Blog about the story the child made in no less than 400 words. Add pictures of the child with the space characters from the pack in the blogpost. 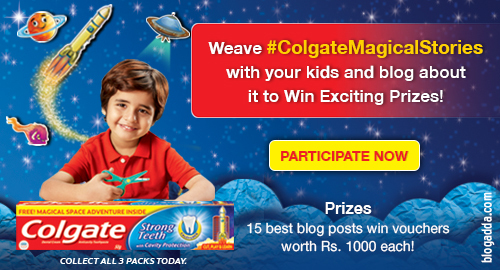 Embed the link of #ColgateMagicalStories video on the blogpost. (The link will be provided very soon). The blog posts will be considered valid only if sent through the submission form. Click on the button below to Register for this activity! And from which link I can submit my blogs. How many blogs r allowed per person? I am not able to find the submission form. So I have mailed the link of post. Kindly tell me about submission form. this is my story for #colgatemagicalstories. Not able to submit, coz i cannot find the submit form. Kindly help/ advice. @All Here is the submission link in case you missed it. Next PostNext WOW – Write about what you DIDN’T do this weekend.